MABD = Must Arrive By Date. Term used in regarding to delivery date requirements. mackinaw wool. Ordinary grade of wool and often has shoddy re-used or remanufactured wool mixed in. Sometimes a cotton warp is used. Very heavily felted and napped on both sides to conceal the weave. Much of the fabric is in a plaid or large check design or brightly coloured, or different colours on each side. Heavy and thick, very similar to melton. Named for MacKinac Island, Michigan. Also called ski cloth or snow cloth. Miners, lumbermen, hunters, trappers, fishermen, and cowboys use much of the fabric for jackets, mackinaws and coats. Also used for blankets, shirts, and some heavy sportswear, windbreakers. mackintosh [Chiefly British] raincoat. A lightweight waterproof fabric originally of rubberized cotton. macram a coarse lace or fringe made by knotting threads or cords in a geometrical pattern. madder a moderate to strong red. madras a fine plain-woven shirting and dress fabric usually of cotton with varied designs (as plaid) in bright colors or in white; a light open usually cotton fabric. Originated in Madras, India and it is a very old cloth. Much of it has a plain colored background with stripes, plaid, checks, or designs. Made with combed or carded yarns depending on the quality. Some is mercerized to make it lustrous and durable. Often the dyes are not fast and with each washing, color changes take place. mahogany a moderate reddish brown. malines a fine stiff net with a hexagonal mesh that is usually made of silk or rayon and that is often used for veils; also, maline. markdown price cut. Reduction of original pricing. marocain a ribbed crepe fabric used in women's clothing. maroon a variable color averaging a dark red. matelasse French for "cushioned or padded". Fabric woven on jacquard or dobby loom, in double cloth weave. The pattern stands out and gives a "pouch" or "quilted" effect to the goods. Crepe yarn in double weave shrinks during finishing causing a blistering effect. In upholstery, coarse yarns cause blistering. Comes in colours, novelty effects, and some with metallic yarns. Gives good wear and drapes well. If washable, it must be laundered with care. It is very attractive and suits quite plain styles. mauve moderate purple, violet, or lilac; a strong purple. maxi a long skirt, long dress, or long coat. Maxi for maximum length dress, etc. 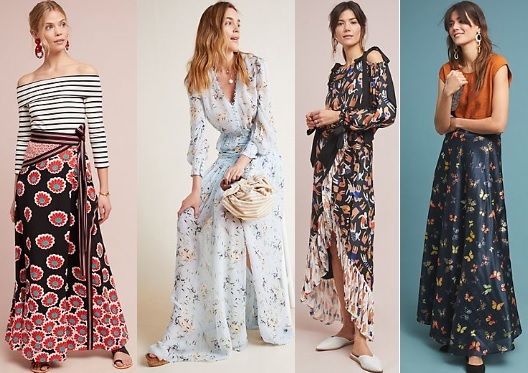 Learn about the popular maxi dress and maxi skirt.